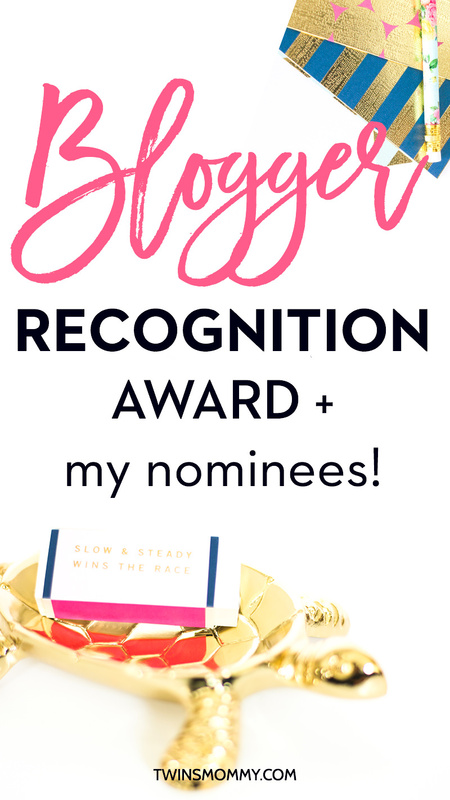 The Blogger Recognition Award + My Nominees! Wow! I can’t believe I’ve been nominated for the Blogger Recognition Award. Thank you to Amanda and Kristen of Kandy Apple Mama and Angela of Natural Born Mommy for this nomination! I’m honored to be included in this nomination! It’s awesome to know that other bloggers recognize my work on this blog and my Facebook group! And it’s cool that I can pay it forward and nominate other amazing bloggers! I love this about blogging – the connection and relationship building! This award is giving to bloggers by bloggers for their dedication and hard work they put into their blog and brand. As a new blogger, I didn’t know about this award so finding out was a complete surprise! 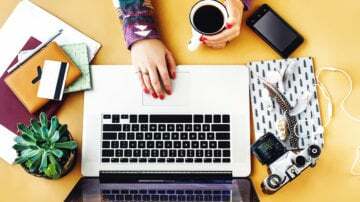 I have a freelance writing blog where I share tips to bloggers and aspiring writers that want to get paid to write online. But, I wanted to blog more about being a mom to twins and the challenges I faced trying to grow my business while nurturing and taking care of my twins. Instead of blogging about that on my freelance writing site, I decided to create Twins Mommy. I wanted to connect with other WAHM moms with little ones and help them during this journey. But, I ended up pivoting! I decided soon after starting Twins Mommy that I wanted to chronicle my blog’s growth. I wanted to try to grow this blog in a traditional way and monetize it in a traditional way…but in an over saturated niche (mom blogging or making money blogging). It’s been a little over a year and I’ve monetized this blog with affiliate marketing and created a course! I’m excited to see what the second year of Twins Mommy will be! Write for your audience, not yourself. Starting a blog is exciting, right? 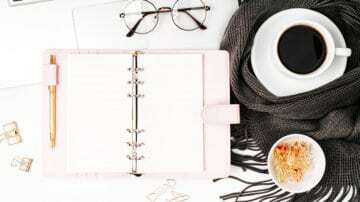 You get to get your creative juices flowing and connect with other bloggers. But be careful not to only create blog posts that are more inspiring than informational. Create posts that can help others (even if you don’t know your audience yet). Your Niche will reveal itself. One of the biggest challenges new bloggers face is figuring out what to blog about! You have this new blog but can’t decide what to put on it. Instead of worrying about finding your perfect niche, blog about what you want. Blog about recipes, parenting, knitting, dating or whatever! Over time your niche will reveal itself. This is what happened to me. Check out these awesome bloggers! If you’ve been nominated, congrats and remember to pay it forward! Very cool congratulations on your success I have never heard of a Blogging nominee award very neat. I joined your FB group mompernuer and your Pinterest group as well. I have been a reader of your blog awhile now I really like your writing. I am a little late but Thank you so much for nominating me! I love your blog and had no idea you knew I existed! This is exciting lol. Thank you again, this means a lot, I will definitely be paying it forward! You’re welcome <3 Love your blog and all that you are doing. Wow, thank you so much for the nomination. I feel so overwhelmed with excitement and motivation to keep working hard! Thank you for all the amazing tips on how to blog well. Can’t wait to write a post about this nomination! Congrats on that and thank you so much! Thank you for nominating me, Elna! I’m so honored. Your blog has taught me a lot about successful blogging practices. I’m always excited when I see a new post from you because I know it will be packed with valuable, actionable advice. Thanks a bunch Erin! And glad to know you are enjoying the free Traffic Accelerator challenge! Love your blog btw! Wow Elna, thank you so much for nominating me! I feel so honored to be nominated with some amazing bloggers, including yourself!! I will definitely be nominating my favorites as well!! No problem. Love your blog and good luck! You've been such an inspiration to me in this past year of starting my blog and my freelance writing career. Your content, your course, and you have hands-down helped me SO much in my journey. <3 Your blog and Facebook group so good luck! Congratulations on your nomination Elna 😎😎. Thank you for the advise on finding your blog niche. I feel more at peace knowing I have time to figure it out, and that it is totally okay if I don’t have it figured out completely yet.